It's a good time to take an updated look at oil, because the paradoxes we observed regarding gold and silver, which we looked at in yesterday's new Gold and Silver Market updates are much more extreme in the case of oil. On the latest 5-year chart for Light Crude we see that oil has in recent weeks succeeding in breaking out of its giant Head-and-Shoulders base pattern at last. We also see that volume has expanded greatly over the past 2 years which is viewed as a sign of a completing bottom. 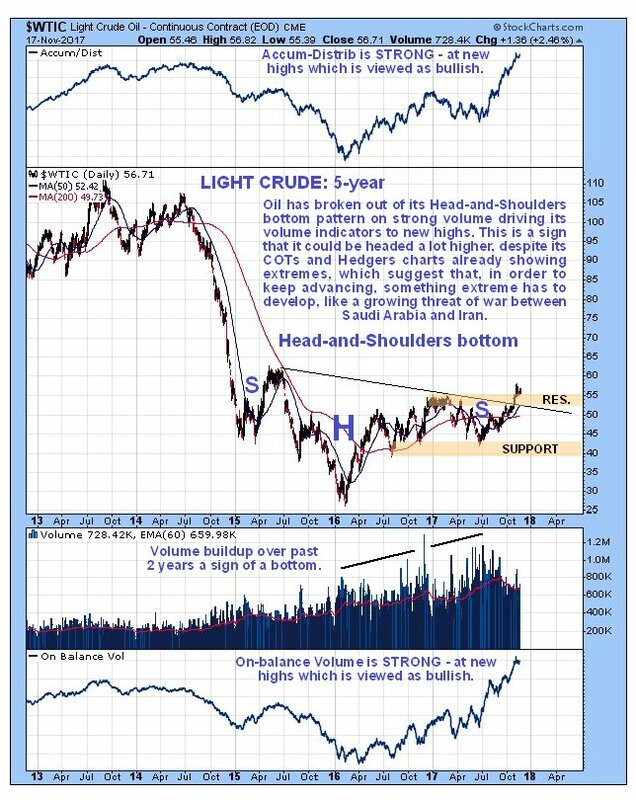 Recent strong upside volume has driven both volume indicators to new highs, despite the price still being way below its 2013 highs - this is viewed as a very bullish sign, and suggests that oil will advance at least to the $80 area. So what's with the bearish looking COTs and Hedgers charts? Ordinarily we would be wary of oil peaking and reacting back upon seeing the latest COTs and Hedgers charts, which flat out contradict what we have just observed on the oil chart. 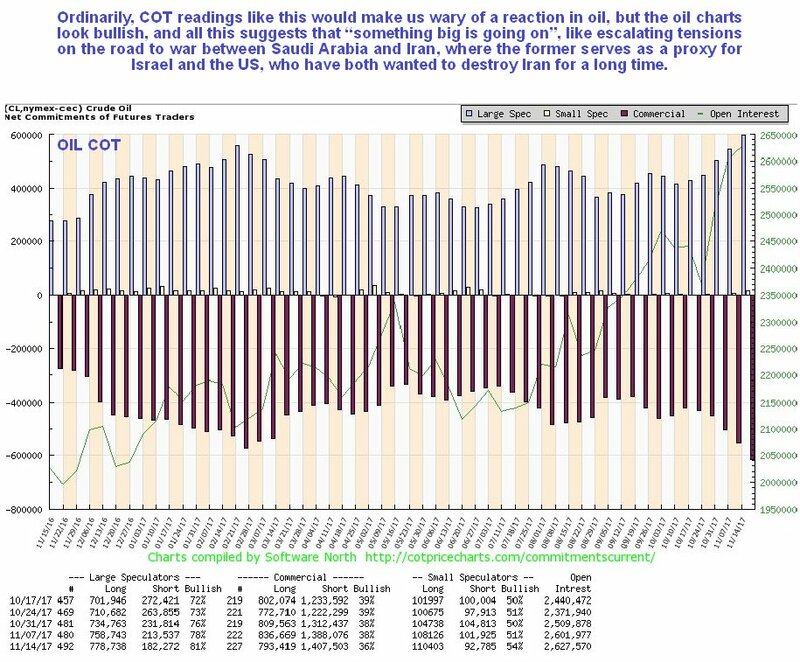 First off, here's the latest oil COT chart, as we can see Commercial short and Large Spec long positions are at their highest levels for the life of this chart, which is 1-year, by a significant margin. This would normally make us wary. 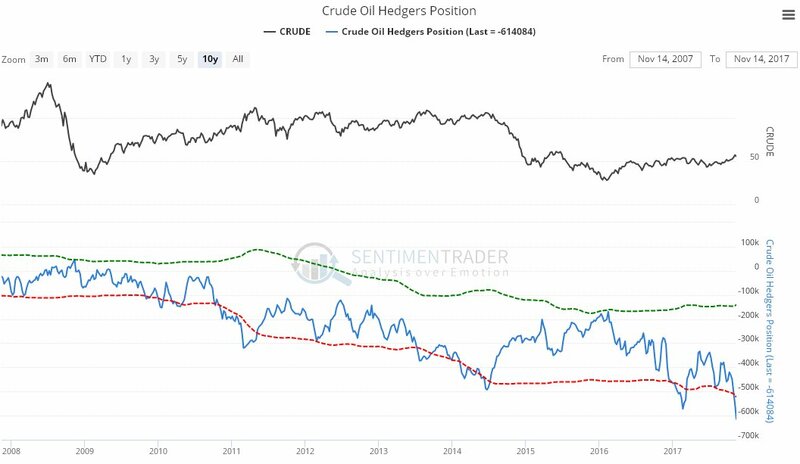 Next the latest oil Hedgers chart on which we see that Hedgers' positions are at the sort of extremes that in the past have led to a heavy drop in the oil price. So what is to be made of this enormous contradiction? The oil charts look flat out bullish, but the oil COTs and Hedgers are at extremes that normally call for a drop. A key point to make here is that high Commercial short and Large Spec long positions do not necessarily mean an immediate drop - these positions can get more extreme still as the price rises before an eventual reaction back occurs, and there is a major fundamental development underway that may lead to that happening. It has been common knowledge for years that one of Israel's dearest ambitions is to destroy Iran, which means, for obvious reasons that we won't bother to go into here, that the US wants to destroy it also. When we now consider that Saudi Arabia is a client State of the US and has been for years, has more than a little hostility towards Iran, and is bristling with US made military hardware, it is clear that it can serve as a perfect proxy partner for an assault on Iran, especially now that it has become more unstable with a new “hothead” Prince running the place. Since we can also see anti-Iran propaganda ramping up, with it being blamed and scapegoated for all the problems in the region, it is clear that the public mind is being prepared for an attack on Iran, and who better to do the dirty work than proxy Saudi Arabia, which we can expect to have the full backing of the US (and Israeli) military. Read Arab League Holds Emergency Session: Iran and “Terrorist” Hezbollah Must Be Stopped for more insights. It remains to be seen what Russia will do should such an attack be mounted, if anything, but they may well do something, since such an attack would clearly be against its interests, but like the US they may act through a proxy or proxies. We mention all of the above because it may explain what we are seeing on the oil price charts in the face of seemingly contradictory COT and Hedgers data. Clearly, if Iran does come under such an attack, the oil price could go through the roof, possibly way beyond $80, hardly surprising since they would probably close the Straits of Hormuz, through which 20% of the world's oil still flows. Keep in mind though that this scenario will not become reality next week, it will likely take time to build up to it, but if it becomes increasingly clear that this is on the cards, we can expect the oil price to advance ahead of it.